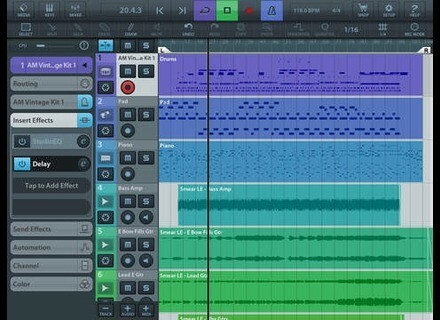 Cubasis LE App, Workstation, DAW or sequencer for iPhone / iPod Touch / iPad from Steinberg. Product replaced by the Steinberg Cubasis LE 2 App. IK Multimedia has announced a new strategic partnership with Steinberg and the newly updated Cubasis LE for iPad. From now on, owners of select IK Multimedia iRig hardware products including iRig Keys, iRig Keys Mini, iRig Keys Pro, iRig Pads, iRig Mic HD, iRig Mic Studio, iRig HD, iRig Pro & iRig Pro DUO can now unlock the Cubasis LE feature set simply by plugging in their IK hardware. 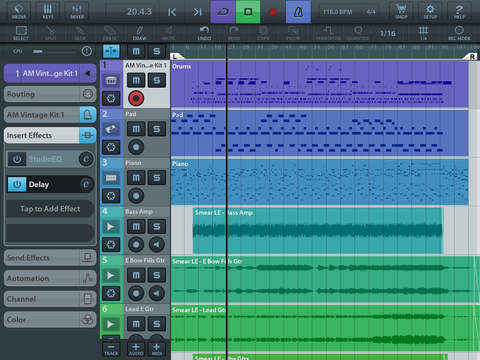 Cubasis LE is the compact version of Steinberg’s Cubasis sequencer for the iPad, and thanks to the project importer musicians can even open Cubasis LE projects in Cubase - both on Windows and Mac. To access the Cubasis LE features, users simply need to download the free Cubasis LE app for iPad, launch it and connect a compatible IK iRig accessory to their iPad. Products that unlock the feature set include the iRig Keys line of MIDI controllers including iRig Keys Mini, iRig Keys and iRig Keys Pro; iRig Pads 4x4 MIDI controller, iRig HD, iRig Pro and iRig Pro DUO interfaces, and the iRig Mic HD and iRig Mic Studio digital microphones. When users upgrade to the Cubasis full feature set, they also get Inter-app audio, which means musicians can use their IK hardware and IK apps like AmpliTube products, SampleTank, iGrand Piano and iLectric Piano inside of Cubasis LE. With IK’s iRig Pro DUO, players can record multiple channels in Cubasis LE simultaneously. They can connect everything from high-end phantom powered condenser microphones to guitars, basses, keyboards and more. Each channel has its own input gain control so players can dial in the adequate amount of input signal for recording, and players can also hook up their outboard MIDI controllers thanks to the included TRS to MIDI-DIN cables and dedicated MIDI in/out jacks. To unlock the LE feature set of Cubasis LE, first launch Cubasis LE on your iPad device, then connect a supported hardware device and wait for the pop-up confirmation that the LE feature set has been unlocked. Cubasis LE is free to download on the App Store and the features set will be unlocked once compatible hardware is connected. D16 Group announce PunchBox Bass Drum Synthesizer The D16 Group announce PunchBox, a virtual synth created in cooperation with sound designers Sound Of Revolution and CFA Sound. 1+1 flash sale on guitar-related plugins at Waves Today only, Waves offers a free GTR3 licence when you buy the CLA Guitars multi-effect processor plugin. Over half off JST's Finality Advanced For a limited (yet unspecified) time, JST offers its Finality Advanced limiter plugin for $39.